Two years ago I planted some Johnny Jump-Ups in my front daylily bed and they’ve re-seeded happily. They were blooming through the snow! I’m leaving them as they sure won’t hurt the daylilies and make a nice groundcover. I love all those happy little faces smiling up at me! 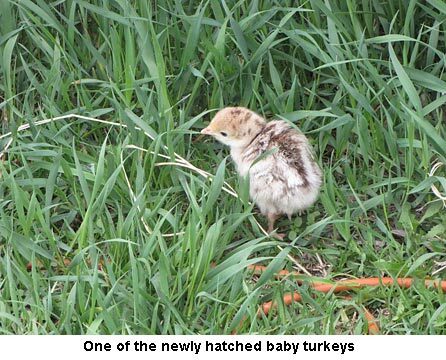 Two days ago, our pearl grey mother turkey came off the nest with babies. She has nine. I worry about them as it’s been cold and raining but she won’t take them inside; we tried to herd them. No dice! But today the sun’s out and it’s warm so I’m hoping more warm weather’s in store for us all. I don’t quite know where to put this, I was reading about something called ‘perpetual spinach’, which isn’t really spinach. The article said it’s a type of chard, it grows all summer, and that bugs don’t seem to be interested in it. The article also said it seldom bolts in the heat, and can stand up to dry conditions, at least to a point.I don’t think I ever heard you mention it on your blog, but I could be very wrong about that. Spinach is something I love, in salads, on pizza, as a replacement for lettuce on sandwiches, and this chard has a very similar flavor. Very glad to see you all seem to be doing well, love the pictures of your birds and flowers. I haven’t seen them, but I have heard five ‘birdsong’ that I can’t ever remember hearing before. We have had such a great end of winter, and spring, perhaps some birds have decided not to go further north? I DID get to see my FIRST actual bluebird this spring, not a picture or off the tv, I was THRILLED; also we have been serenaded by by a couple of male pheasants, from the back of my property lined, and got to see them also. This is the first time in over 12 years that we’ve been lucky enough for that, WOOHOO! You’re right. 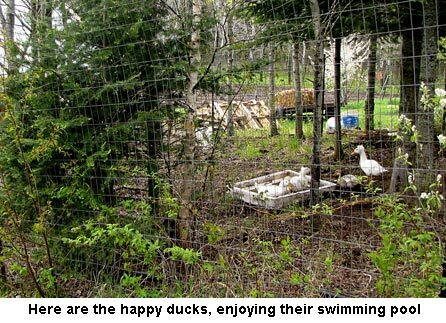 Here, the winter keeps them from getting out of hand, yet a few come up every year to cheer us after weeks of sub zero. They make a nice ground cover between my daylily plants, which also crowd out weeds quite well. Gosh you are brave to encourage Johnny Jump Ups. Where I live they are almost impossible to get rid of once you get them and they have the status of a noxious weed, even with their cute little faces. They crowd out everything but bindweed and thistle. Amazing how viewpoints vary by location and custom. Jackie, that’s exactly what my grandmother said about her Johnny Jump Ups and pansies. She said they also looked like small faces smiling at her and if there was a slight breeze, it looked like they were nodding and talking to her. My grandmother passed away two years ago at the age of 101 years. We were very close and I miss her deeply. Your comment brought fond remembrance as it was exactly what she said.